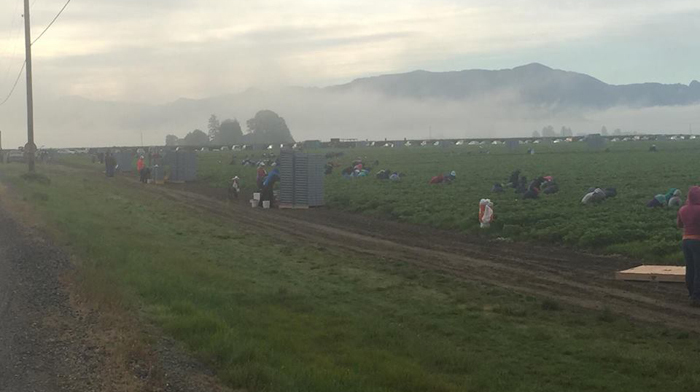 On June 19th workers started harvesting strawberries at Sakuma Brothers Farm in Washington. The first day of picking is always a seasonal milestone, but this year there was particular significance. For the first time workers are protected by a contract and a union. For the last four years, the season started with labor disputes and mounting tension. Finally, in September 2016 a formal agreement was reached between the farmworkers and Sakuma Brothers and a democratic election confirmed Familias Unidas as the union representing hand harvesters on the farm. The contract spells out a fair payment model for workers, a per pound rate that is calculated to average $15/hour with a minimum of $12/hour. In addition, the contract outlines a grievance process and other benefits and conditions for workers. Beyond the specifics, the contract represents the commitment of workers and management to move forward towards the goals of fair livelihoods for workers and a profitable farm for the future. We are so grateful to the nearly 10,000 of our friends and readers who signed petitions and acted in solidarity with farmworkers throughout the long struggle. Fair World Project congratulates both Familias Unidas and Sakuma and we send best wishes for a productive growing season. Read more on the history of Sakuma and Familias Unidas. Read perspectives from the union president and farm CEO.